Originally published in the Times of Israel Blog. Though I returned my desk chair to the study, the downstairs remains empty while we await Harvey’s lingering fate. The forecasts vary as to the storm’s exit. Tuesday? Wednesday? Thursday? So far, we’re the lucky ones. I’m writing from my desk on my computer powered by electricity and connected via Wi-Fi. But with the potential for more rain, we hold our collective breaths. We flooded in Tropical Storm Allison, the 2001 event which dumped 35 inches of rain over parts of the city after it, like Harvey, stalled over Houston. My wife and I carried our two children, then 2 and 4, out of our one-story home at 1 am through waste high flood water to higher ground. Two years later, we moved into a two-story home built on the same site thirty-six inches off the ground. Rescue boat floats down my street. 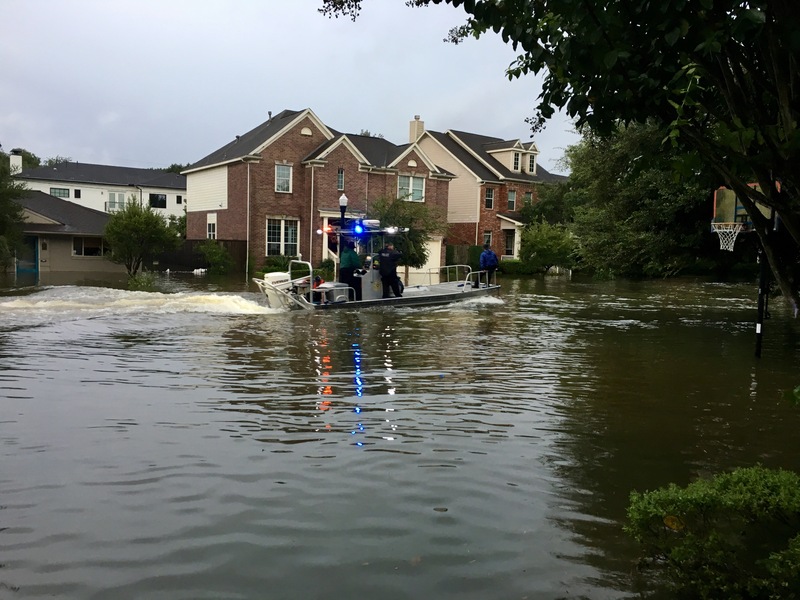 This past weekend we required almost every one of those inches to stave off Harvey’s deluge as the flood water rose to within less than six inches of our home before finally receding. Before it did, we watched rescue boats zip past as though we lived near a marina and viewed helicopters overhead as if at an air show. Our garage, built at the level of the original house, received 30 inches of water, enough to finish off the car housed inside. (We stored our two other vehicles in parking garages). Flood and car insurance will help recover these loses. Although Harvey mimicked Allison’s stalling pattern, it cast a far wider net over the entire metropolitan area and the whole of Southeast Texas. Harvey’s rain caused unprecedented destruction on an epic scale. 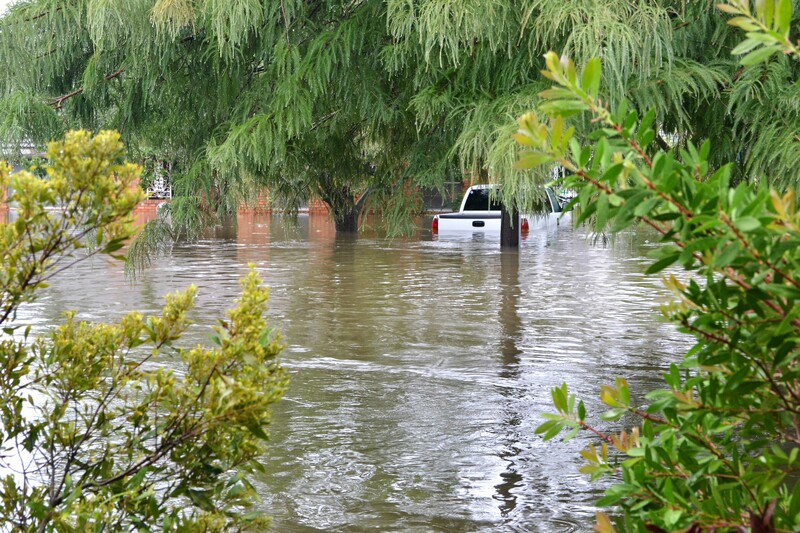 Numerous relatives, neighbors and friends suffered significant loses to their property. Some even flooded for the second or third time in the past two or three years. Fortunately, and most significantly, no one mentioned suffered any physical injury though tragically, authorities report some fatalities throughout the area. Clearly, the road to normalcy is long and winding for those affected as well as the City of Houston. 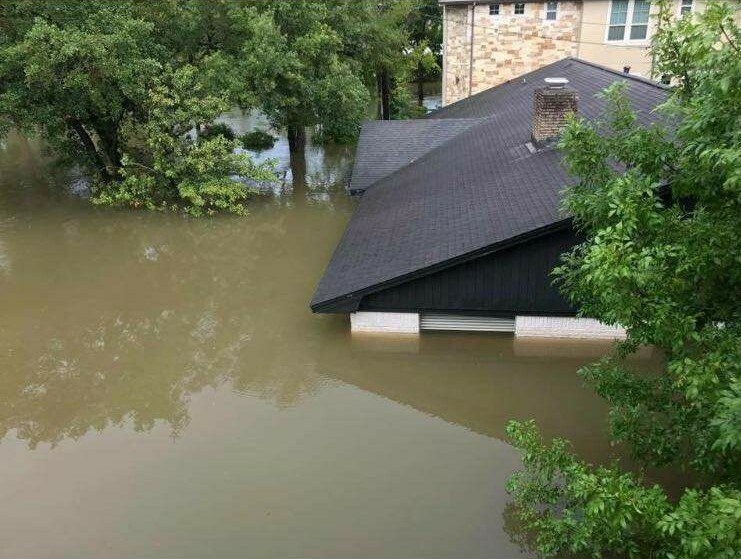 Harvey heavily battered Southwest Houston, a part of the City wherein many of Houston’s 55,000 Jews reside and the location for most of the Jewish communal buildings. The exact number of homes impacted may reach into the hundreds. Meanwhile, at least the following Jewish Institutions experienced significant water damage: the ERJCC and its satellite, The Merfish Center, Congregation Beth Israel, United Orthodox Synagogue, and Congregation Beth Yeshurun. While insurance and local resources will provide the primary source for the recovery, any outside assistance undoubtedly helps the affected individuals and institutions. Please consider donating to a fund set up by the Jewish Federations of North America to help Houston’s Jewish Community. If any U.S. city possesses the capacity to swiftly recover from a calamity of this proportion, it is Houston. I suggest this not as a rallying cry but because of the City’s enabling characteristics that include infrastructure worthy of the Country’s 4th largest city, a stout economic base, strong political and civic leadership, and an entrenched, resolved populace. Additionally, Houston’s ability to harness the strength of its diversity enables a quicker recovery. While the most diverse city in America faces significant challenges, ethnic and religious differences will not be one of them. To assist the City of Houston with the Harvey recovery, please consider donating to a fund set up by the Office of the Mayor of Houston.